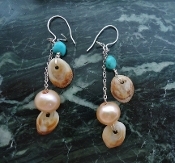 Perfect for a one of a kind gift--whether to a loved one or yourself!! Other color variations are easy to customize. 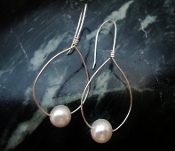 One simple tear dropped hoop pierces these high luster, silvery white pearls. 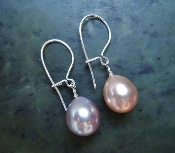 This is an affordable, classic pair of earrings with a modern twist. Each pair is designed and hand wrapped per order, so do not hesitate to add specifications in our "Special Instructions" section. These 14kt Yellow Gold Pearl Earrings are timeless, simple and elegant. 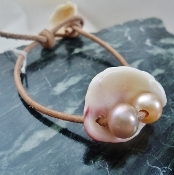 They're simple design highlights the purity, beauty and luster of the pearls.